*NSHC's program of study and practice is the same for both types of providers, but testing is different, as liability is different for the clinical practitioner compared to the allied healthcare provider. This allows all of the healthcare team to project the same philosophy and implement the same engagement skills to the level of their credentials and to their employer's expectations. NSHC's Self-Study Manual is available in Hardcopy or E-Manual for those that prefer to study online at our website. Both study manuals include additional online study resources, tools, and online testing. The credential of CHC (Certified Health Coach) is granted upon passing the NSHC timed Certification Exam and Skills Competency and is valid for 5 years from the date the exam is passed, as long as one remains in good standing with the Society, one's professional license/credential remains current in our database for the term of the 5-year certification and is unencumbered by the issuing body. Testing: One complimentary certification testing session is provided when testing is completed within 12 months from the date of purchase. If the Certification Exam is not passed on the first attempt, there is a one-time 30-day wait period to re-test. Additional exam attempts ($50) may be purchased in the Member's Store. There is no waiting period to re-test the Skills Competency component of the exam ($25). Testing after the 12-month complimentary period will incur a $50 testing fee and a $50 NSHC membership renewal fee, if applicable. Clinicians Residing Outside of the U.S. are eligible for NSHC certification. NOTE: It is the responsibility of the individual to determine if and how the NSHC certification will be recognized and used in his/her specific country. Employers use NSHC's Member's CHC Registry to validate the status (Active or Inactive) of one's Health Coach Certification. A current unencumbered professional license/credential (e.g., MD, RN, RD, COTA, RPT, etc.) in the NSHC database, a current health coach certification, and a current NSHC membership are required to be listed as "Active" in the Member's Registry. Members who do not update the expiration date of their professional license after renewing with their State or Organization credential provider will appear as "Inactive" in the registry. Each member is responsible for maintaining current license and demographic information in NSHC's database for the 5-year term of the CHC certification. NSHC offers a Certificate of Completion to allied healthcare providers. The NSHC Certificate of Completion is granted after passing the online Post Test and Skills Competency. Study materials are the same for all NSHC members, but testing is different for those with a clinical license/credential due to liability differences. The Certificate of Completion demonstrates that one has successfully completed NSHC evidence-based health coaching education program and testing. 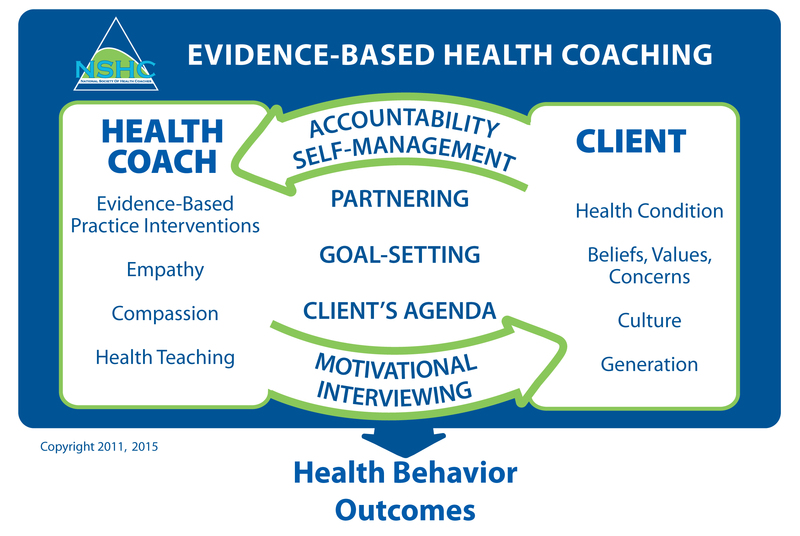 Employers may then determine how one's new health coaching knowledge and skill will be used within their organizations, under the direction of a supervisor. An NSHC Certificate of Completion does not grant one the right or responsibility to independently promote themselves as an NSHC Health Coach, or coach another individual without employer supervision. Many allied healthcare providers choose NSHC's Certificate of Completion over another organization's Certification due to NSHC's focus within healthcare settings. NSHC's Certificate of Completion is granted upon passing the timed, online Post Test that includes Skills Competency. One complimentary testing session is provided when testing is completed within 12 months of one's purchase date. If you are not successful in the first test attempt, you may re-test at any time. The re-test fee is $25. Testing after the 12-month complimentary period requires a $25 testing fee and $50 NSHC Membership renewal fee. All testing attempts and membership renewals may be purchased in the Member Store. All testing is conducted online. A member is expected to use his or her own unique username and password to enter the private member area to access and complete testing independently, without collaboration or assistance from or with others. During the NSHC routine quality reviews, should the Society for any reason believe that user integrity is in question, or that an exam has been breached or compromised in any way, including the sharing of test questions or answers between individuals, it reserves the right and authority to revoke individual NSHC membership, Certification or Certificate of Completion, and any CE credit associated with such testing. Employers, who have their users testing as a group, are strongly advised to proctor their testing. The NSHC maintains the privacy of member test results, including members who are part of a company or association group. Contact hours and credits are provided complimentary by the NSHC. 42 Continuing Education Contact hours for Nursing and Physical Therapy are granted by Scully Health Management, Inc. (954-242-0515), Coral Springs, FL, an Approved Provider by the California Board of Registered Nursing (CEP 14223), Florida Board of Nursing (NCE3358) and Approved by the Physical Therapy Board of California. The Commission on Dietetic Registration has approved NSHC's program for 42 CPEUs for its Registered Dietitian; Dietetic Technician, Registered; Registered Dietitian, Nutritionist; and Nutrition & Dietetics Technician, Registered. "Learning Needs" Codes for the Commission on Dietetic Registration are 6010, 6020, 6070, and 6080. All other individuals qualified for NSHC Certification and also Allied Healthcare Providers, upon passing, receive 42 CECs from the American College of Sports Medicine(ACSM). The American College of Sports Medicine's Professional Education Committee certifies that the National Society of Health Coaches meets the criteria for official ACSM Approved Provider Status from 2015 - 2018. Providership # 701294. NSHC's program is also pre-approved by the Commission for Case Manager Certification to provide 42 CE credits to Certified Case Managers (CCMs). NOTE: Those granted CE Contact Hours are responsible for safely maintaining their respective certificate in their own personal files and for submitting to their own Professional Board for approval. Recertification is required every 5 years and is achieved only through re-examination. The exam will reflect the content of the most current NSHC Edition of its self-study program. NSHC Members will register for recertification and test prior to the expiration of their CHC credential to avoid interruption in their certification status. A current NSHC membership, in good standing with the Society, and an active unencumbered license/qualifying credential are required to recertify. Register for recertification in the Member Store after login or contact us to request an invoice to pay by check. Hard copy manual ships to the address in our database. One test attempt when the attempt is completed within 12 months of purchase date.